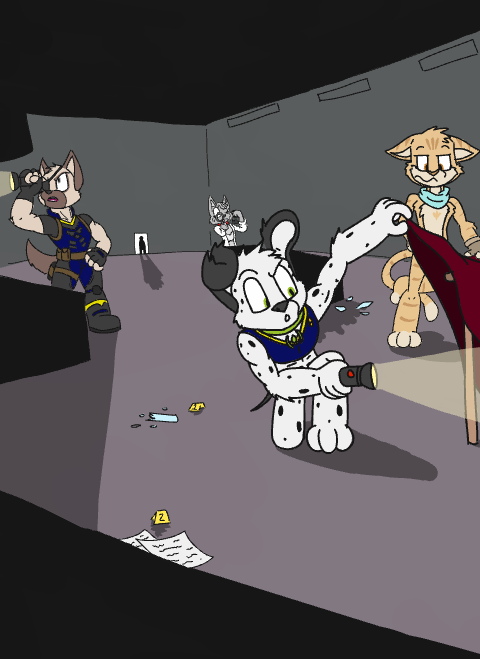 Welcome to Case: Housepets!, a community driven choose your own adventure mystery game where you and your fellow forum users will determine how the story goes! This game is heavily inspired by (and partially parodies) other adventure games such as Heavy Rain, The Telltale games, and the comic "Prequel". The players (that's you guys) will take control of one of 5 characters throughout the game and make decisions that effect and direction of the path of the story you go down, and ultimately shape who these characters are and what their motive is. While some choices may seem small or incredibly drastic, all choices and actions can and will effect the outcome of a scene, and may even cost you a character. -In tight situations, will become enraged. -Action: A request to do something ranging from picking up an item to doing a flip! -Hint: You may ask to have a hint if you have no idea what to do. This is most effective during free roam scenes, but if I find the scene too linear, obvious, or important that you are the one who decides, it'll probably be as simple as "Act fast" or "Think carefully"
The only way to get a "game over" is if all characters become in-active. This means that if a character goes "missing", or becomes "in-active", THEY ARE GONE. Depending on the scenario and how you've played the game, another character may notice that said character has gone missing, and can go on a "redemption mission" to go look for them. However, you may not want to do these for personal reasons or because you feel it's not safe, as these missions are VERY RISKY. If you see an exclamation mark in the corner of a scene, it can mean a 1-4 level of danger. This doesn't always mean danger to a character though, it can also mean you are in danger or losing evidence or failing a scene, therefore hurting your chance of solving a mystery or even your ability to progress in the game. -Red warning, level 4 danger. Hope that you never have to see this, because this means that depending on your next move, you could lose a character then and there. Disclaimer: While all that sounds scary, there's nothing terribly graphic or horrifying that will happen, this is still Housepets! after all. The story is somewhere between PG-PG13. It may discuss serious or dark topics at times, but it's still pretty cartoony for the most part. A lot of it is parody of the more serious games it's inspired by. However, when you either chain too much, or begin to make incorrect chains (like ones that don't make sense or everyone susbmits a different chain), you will receive minor penalties throughout the game. The way I measure this is through something called "Karma". Karma is expressed in game through pink text, and will warn you when you are accumulating said karma. Depending on how much karma you have accumulated, a character will randomly slip up at any given scene. The more Karma, the higher chance of it happening at riskier scenes. You can trip on a pebble while casually walking across the sidewalk, or sneeze when you are trying to sneak around an enemy. 1 - Stop chaining. The Karma will eventually fade away on it's own. 2 - Feel the effects of Karma. Once you're hit with Karma, it will reset to zero. 3 - Make a perfect chain. Feeling lucky? If the majority of people all agree on a chain that happens to have a really good outcome (or an intentionally really bad outcome), your Karma will fade away. However, this is not something you should try to do, you will probably gain far more Karma than lose it attempting to do this. It's better to let this happen naturally then attempting to force it. There will also be scenes where I don't allow you to chain at all for plot reasons. But keep in mind that just because I allow you to chain in a scene, it doesn't always mean you should. I recommend you try to coordinate your chains before you do them, if you even do them. If everyone has different chains, calculating the votes as to what to do can be a bit complicated as I have to add together every time an option is listed. If the chains are too confusing for a given scene, I'll try to just ignore them and go with the most selected choice instead to save you from stacking up on Karma instantly. You can also accumulate "Good Karma" by not chaining while at zero Karma, getting through combat scenes mostly successfully or intentionally poorly, or by doing specific actions. Good Karma grants you one free chain regardless of it's outcome. You can also use it to remove any Karma you may have accumulated instead. Now that that's all said and done, we will begin this game whenever you guys are ready, just say the word! If you have any questions before we start, feel free to ask. I'm curious to see which path you all take this story, or if you manage to create a path I didn't predict would happen. Last edited by CHAOKOCartoons on Thu Dec 20, 2018 2:34 pm, edited 37 times in total. ...interesting, really. This could very quickly become cluttered, though. Maybe when a "chapter" is done, the story thus far can be compiled into an easy to read entry. More motivation to attend the forums? Dibs on Echo! Where are Alfa and Delta? Well tame my crumpets and call it a biscuit, I'm in.. I agree. I plan on making a separate category in the "Fan Projects" topic that is pretty much that. Once I get my laptop back, I'll also make the case files more stylized and look cleaner, and even make a blog/site dedicated to telling the events of the game like the separate topic. This would also make looking over character files and managing inventory much easier as they can all be in separate places and you wouldn't have to keep checking the first post of this topic. On the outskirts of Babylon Gardens, there is a moderately sized white house surrounded by trees. In the distance, you can see a city, and if you travel far enough to the left of the house you can find a river running though the collection of trees. The house looks to have seen better days; It's paint has begun to chip, and the grass around the porch has clearly been left un-managed for quite some time. Still, the lights from the inside give off a sense of comfort. 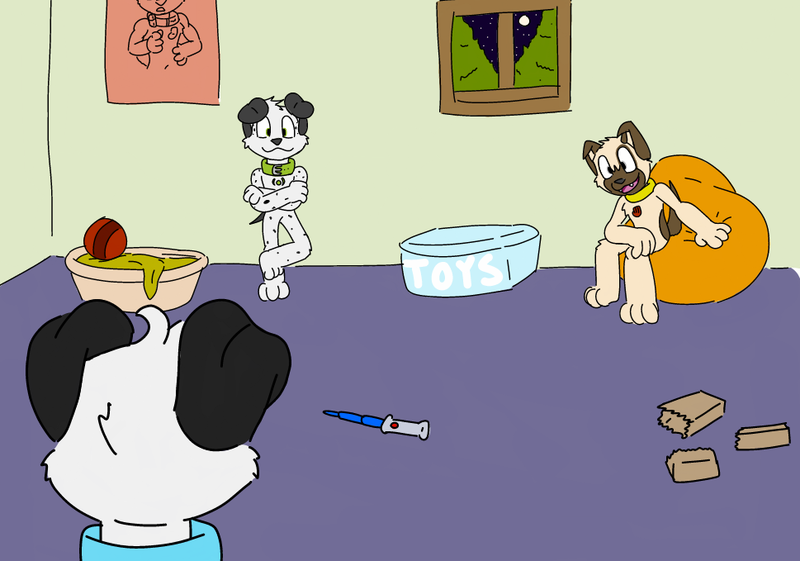 On the second floor of the house, 3 young pups sit in their room. The first, with green eyes and 3 spots on the upper portion of his face, is "Echo". The second, another spotted pup with turquoise eyes and 3 spots on his cheeks, is "Charlie". The third, a tan pup with a brown muzzle and grey eyes, was "Bravo". They where told by their Mother and Father to wait in their room until dinner was ready, leaving the pups to find a way to entertain themselves. This was a bit unusual though, they'd never been made to wait upstairs just so that dinner could be made. What's so different about it this time? Bravo: Well... this is a bit weird huh? I wonder what Mom'n Dad are making that we can't see! 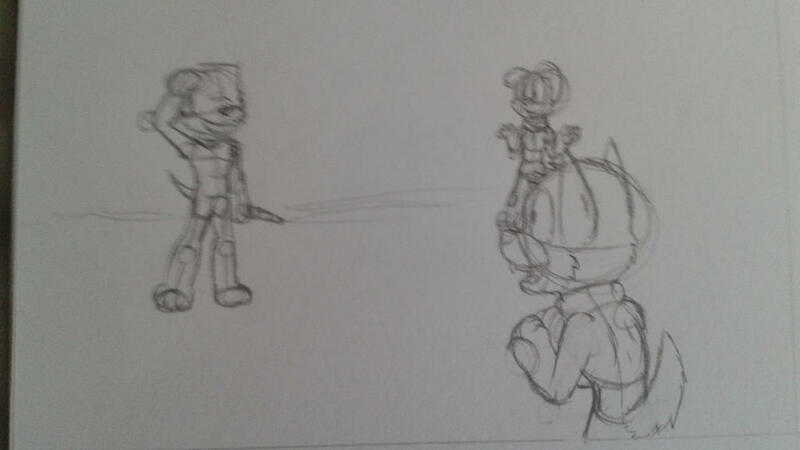 Bravo: FIIIINE, have it your way Echo, I figured you'd be to scared to do a little snoopin' around anyway. Whad'ya wanna do while we're up here anyway? Echo: We're always the ones pickin' what to play, I was thinking we ask Charlie what he wants! he's been quiet this whole time, surely you're thinkin' of SOMETHIN' over there little bro! Bravo: Yeah Charlie, what do you think we should do? Maybe you're up for a little "recon mission"? Bravo: I'm just sayin! It's your choice Charlie! This is a "free roam" scene. Do as you please. Last edited by CHAOKOCartoons on Tue Aug 23, 2016 5:04 pm, edited 1 time in total. Imaginate favorite Star Wars scene? I'd say to go with Bravo to investigate..I mean c'mon We ain't got magic powers, might as well go stealth mode and pull some spy action. I mean there's no crime I'd you don't get caught. Sorry FancyHat, but I agree with D-Rock. 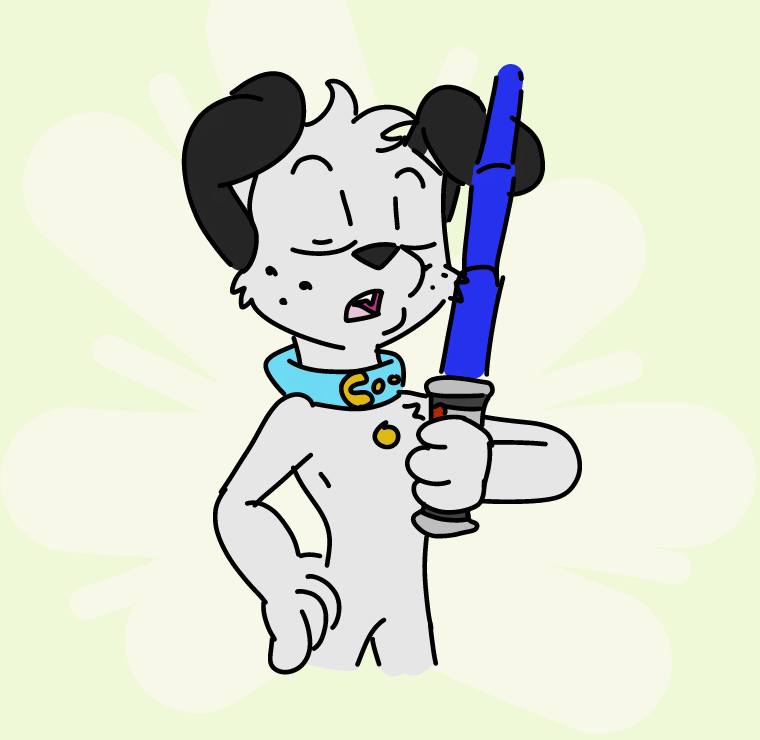 *Deep, scary voice* Charlie, I am your brother. I'd say we go down and investigate. Action/Talk(not sure what it counts as): Ask to Imaginate Star Wars. This sounds interesting, but I will stick to the shadows for now and wait awhile till I get the real meaning of the game. 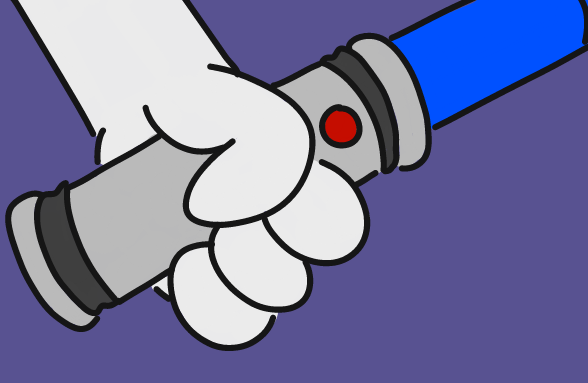 Action: Pick up the toy lightsaber and store it in inventory. These actions have been noted, and will be addressed shortly. He looked to the poster on the wall. It was a K-9 unit poster Bravo had gotten on the day Dad took them to the police station to show them around. 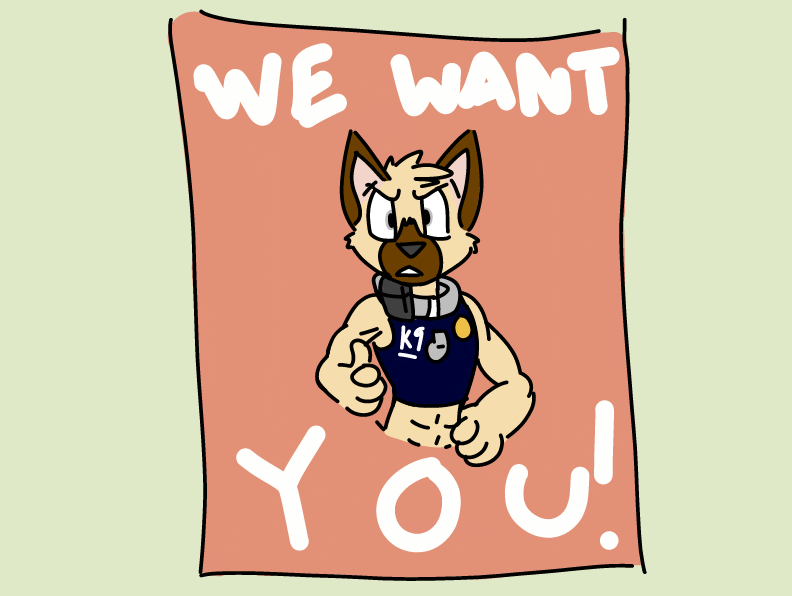 The words "WE WANT YOU!" are printed at the top and bottom of the poster, with the leader of the Babylon Gardens K-9 unit in the center pointing back at him. His name was Sergeant Ralph, he looked a lot like Bravo, (that's probably why he took such a liking to him). The K-9 unit seemed very well behaved, strong, and from what Dad said, they where very brave. Charlie wanted to be like just like them! But what was it that Ralph told you while you where there? What's the most important part about being a Police Dog? 1: "Being brave, do what others wont! Look for the truth, even if it gets you in trouble. Trust your gut, and you'll find the right path!" 2: "Doing what you're told! If your superiors tell you to do something, it's for a good reason! Disobedience only brings more trouble!" Last edited by CHAOKOCartoons on Mon Aug 22, 2016 3:39 am, edited 1 time in total. I vote for "Doing what you're told!". Ralph obviously told you to do what you're told, Charlie. I vote option 1, Semper Fi. Knowing Ralph, he probably said "Doing what you're told." Wait, that's probably metagaming, isn't it? Number 1 sounds more heroic and empowering, but 2 seems more practical, esp. for a Police Dog. I also vote for "Doing what you're told"
I think, after considering the poster, we should talk to bravo, and ask him if he REALLY think's it's a good idea, especially because (I think) bravo wants to be a K-9. Last edited by Tales on Mon Aug 22, 2016 10:26 am, edited 2 times in total. I tend to play these kinds of things safe, so do what you're told. Seems more in-character with how Ralph is, so it makes sense that this would be the advice to give. Since Bravo is shown to wear an eyepatch later on, let's see if we can steer him to plan his actions better, to help stave off that event as much as possible. Charlie: A good dog always does what they're told, Sergeant Ralph said so! You of all dogs should know this Bravo. Bravo: *Sigh* yeah, guess you're right. As tempting as it is, we should stay put. What're we doing then Charlie? This sketch brought to you by Adobe Draw: Adobe Draw - Hiding my saved projects since the beginning of this game! Charlie: Why don't we finish up our Star Wars Imaginate session? We've probably got just enough time to do the final scene! Bravo: Oh yeah, I totally forgot about that! I'm down for that, let's do it! Echo: Hold on, first things first, who was who again? It's been a while, and I want to make sure we stay consistent. Sat is my role call. Last edited by FancyHat on Mon Aug 22, 2016 9:10 pm, edited 1 time in total. This will be my first telltale game experience, apparently. 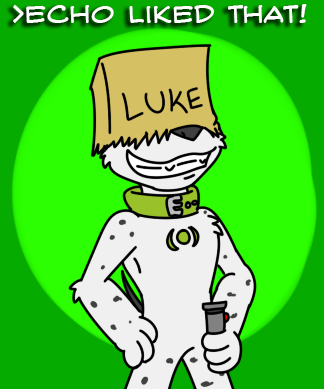 Echo as Luke, because Green. 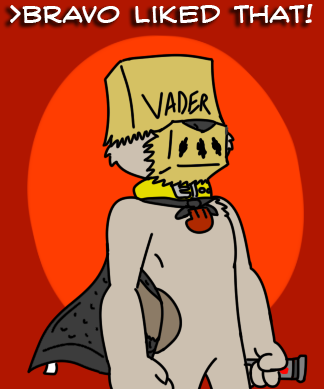 Bravo as Vader cause serious. 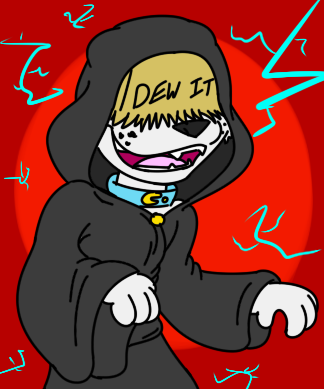 And Charlie as Palpatine, just cause it'd be funny. I vote for SuperStar's idea. I agree with FancyHat and Neowulf. Well gosh darn it you evened it up again right as I finished the update . Considering I already finalized the decision, we'll just keep going with it. Plus, stats wise, you'll probably be okay with the outcome. Echo: Of course! There wasn't a doubt in my mind! Echo: Umm... isn't that kind of a safety hazard Bravo? And I wa--DEH! was The Emperor! Charlie: Alright, you guys will have to come through the door when I tell you to. I'ma get the room ready in the meantime, you two just wait out there for my call! Echo: But, I thought we weren't going to leave our room! Bravo: Calm down, we're only going to be a good foot away from the door. There's no way they'll notice us sitting there for a minute or two! Bravo: I know, I know! I'll stay right in front of the door, I'm a good dog! Charlie: Alrighty, I'll tell you the second I'm done, make sure to keep your ears open! Last edited by CHAOKOCartoons on Sat Dec 24, 2016 5:27 am, edited 1 time in total.